Robert Wagner and Stefanie Powers return after a successful series run as Jonathan and Jennifer Hart for four feature-length mysteries that will entertain and thrill you. See everyone’s favorite crime-solving couple, along with their loyal butler, Max (Lionel Stander), and their dog, Freeway, in these four whodunits. In HART TO HART RETURNS, the Harts deal with shady government contractors. In HART TO HART: HOME IS WHERE THE HART IS, the two return to the town where Jennifer worked as a reporter to deal with her old mentor’s mysterious death. 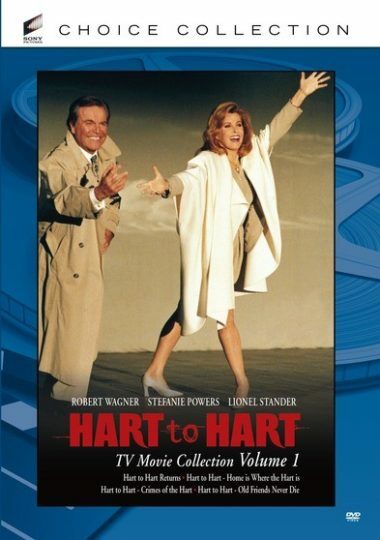 In HART TO HART: CRIMES OF THE HART, the Harts go to New York to see a play Jennifer wrote, but find themselves investigating the murder of a stagehand, and Jonathan is a suspect! Finally, in HART TO HART: OLD FRIENDS NEVER DIE, the Harts attend a publisher’s murder mystery party, but begin to wonder if it is real. With stars such as Maureen O’Sullivan, Roddy McDowall, Richard Belzer, Mike Farrell and Fred Willard, these four HART TO HART movies are a must for any mystery lover’s collection! Newly remastered. 4 DVD Set – 4 Full-Length Movies.